SALT LAKE CITY — If there’s such a thing as a perfect quarter, the Utah Jazz came close to playing one. 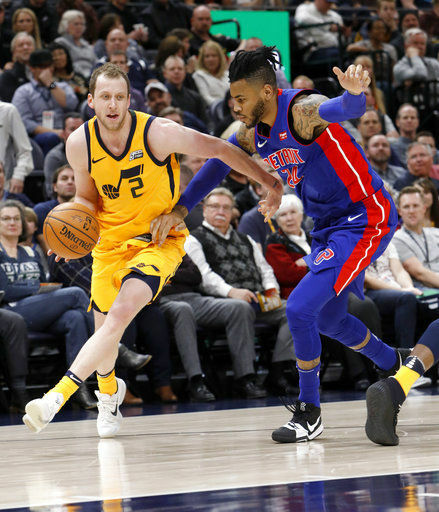 No one could have scripted a better start to Utah’s 110-79 victory over the Detroit Pistons on Tuesday night than what unfolded for the Jazz in the first quarter. They never trailed and buried Detroit early behind a barrage of crisp passes and smooth baskets. Utah went 17 of 21 (81 percent) from the floor in the quarter and scored on its final 10 possessions to take a 42-21 lead at the end of the period. Four players — Rudy Gobert, Jonas Jerebko, Derrick Favors and Jae Crowder — each went 3-for-3 from the field in the period. Gobert had 22 points and 12 rebounds, one of six Jazz players who scored in double figures. Joe Ingles added 17 points, seven assists and seven rebounds, and Jerebko had 16 points and eight rebounds. The Jazz won their seventh straight and 19th of their past 21 games. Utah has lost just four times since Gobert returned to the lineup from a knee injury on Jan. 19. Luke Kennard scored 18 points and Andre Drummond had 13 points and 11 rebounds for the Pistons, who have lost 11 of 14. Detroit got within 44-29 in the second quarter, but Utah responded quickly. Gobert dunked and Ingles turned a steal into a transition 3-pointer to push Utah’s lead to 52-31. 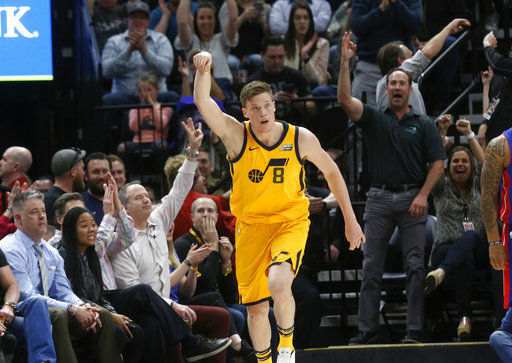 Donovan Mitchell hit a buzzer-beating 3-pointer to end the third quarter and put the Jazz ahead 81-51. The Pistons never shot better than 40 percent from the field in any quarter and shot just 30-of-80 (37.5 percent) overall. Pistons: Detroit lost its 10th consecutive road game. The Pistons’ last road victory was 114-80 over Brooklyn on Jan. 10. … F Reggie Bullock did not play after injuring his back and right knee in a vehicle crash on Sunday. Bullock has averaged 17.8 points for Detroit over his last five games. Jazz: Posted season highs in points and field goal percentage in the first quarter. … The Jazz registered 29 assists on 42 field goals. … Jerebko matched his season high with eight rebounds. Utah finished with a 52-32 advantage on the glass. One memorable spot for Detroit in an otherwise forgettable game came in the team’s effort to disrupt passing lanes and create turnovers. The Pistons collected a season-high 14 steals and forced 24 turnovers overall. It extended their NBA-best streak of games with 10-plus takeaways to 54. Detroit forced just three turnovers during Utah’s first-quarter blitz that put the game out of reach. Favors collected just four rebounds, enough to help him climb to 10th place on Utah’s all-time rebounding list with 3,602 rebounds. He passed former Utah center Mehmet Okur, who pulled down 3,599 rebounds with the Jazz. Pistons: Visit the Nuggets on Wednesday.